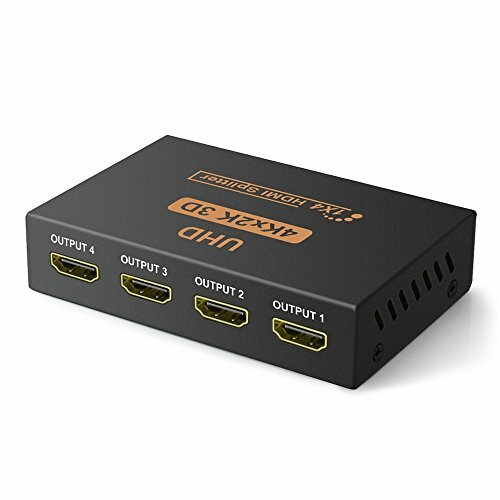 Distribute the input HDMI signal to four indentical HDMI outputs simultaneously. Xbox 360, Xbox One, Playstation 3, Playstation 4, Beamer, DVB receiver, TFT monitor, HD Ready or Full HD TV, Blu-Ray, DVD or HD-DVD players etc. Split one HDMI input signal to four displays. Outputs are synchronized and amplified. HDCP 1.2 Protocol Compliant, RoHS compliant, ATC Tested. In The Package: 4-Port HDMI Splitter, 5V AC Adapter, User Manual. Backed by an Aobelieve one year warranty. If you have any questions about this product by Aobelieve, contact us by completing and submitting the form below. If you are looking for a specif part number, please include it with your message.